This article lists the best GNOME-shell and GTK themes which are worth looking at. Though there are numerous themes out there, we have listed only the best. Keep an eye on this article as this page will be updated as artists create more themes for the most popular Linux desktop environment. Besides bringing numerous changes in GNOME behaviour, the GNOME Foundation has also revolutionised theming on the Linux desktop. GNOME 2 could be massively customised and GNOME 3 follows that path. 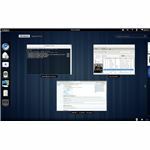 One of the major changes brought by the GNOME developers is the incorporation of web technologies in the desktop environment (in fact, it is possible to run GNOME applications in a web browser). Therefore it should be of no surprise that CSS can be used for theming GNOME. Keep in mind that GNOME 3 can be used without GNOME shell. Hence, there are two types of themes available: GTK3 Mutter themes and GNOME-shell themes. In this article, we shall look at some of the best GNOME-shell/Mutter themes available. This page will be updated frequently to add more themes, so keep an eye here. You will also find instructions to install these themes at the end of this article. The default GNOME-shell theme is quite good. If you want to move away from the generic style however, you can install any one of these themes and give your Linux a unique look. Smooth inset: This is a very popular theme created by half-left. A transparent light theme which is suitable for all occasions. Preferably use a light background along with this theme. You can get the theme from here. A nice wallpaper to go along with the theme can be found here. Token icons look very good with this theme. Gaia: Another beautiful theme created by half-left, the Gaia theme celebrates nature and mother Earth. This is an amazing theme which is a must for all you nature lovers. Get the theme from here. The Gaia icon set goes very well with this theme. Orta: Another quality theme from half-left, Orta takes a silvery-greyish take at GNOME theming. Using oval shaped buttons, this theme is a treat for the eyes. Get it here. For those who like the wallpaper, get it here. A darker variant of the theme is also available. Elementary: Elementary is a very popular project, which many describe as visually refreshing. Half-left, again, has designed a theme which goes very well with the existing Elementary artwork. It can be downloaded from here. Atolm: People who favour dark themes will be pleased to see this. Atolm creates a sense of perfection and neatness. The black theme, when coupled with a dark wallpaper is probably one of the best dark themes available. You can download it here. Atolm looks best with the Atolm GTK3 theme. DeviantArt: This is a theme which is taregeted towards DeviantArt fans. Artists, who are familiar with DeviantArt layout will be pleased to know that this theme uses the DeviantArt color scheme.Download the theme from here. Nice colorful wallpapers go very well with this theme like the ones over here. Tron Legacy fan art: This theme should appeal to Tron fans. Having a very Tron-ish look this may be a niche theme. Get the theme from here. These wallpapers go very well with the theme along with the Zero Threes font. Ubuntu Ambiance: Inspired by the Ubuntu Ambiance GTK theme, half-left has created this awesome GNOME-shell theme which is available here. Needless to say, the Ubuntu Natty Official wallpaper pack go very well with this theme. Black Glass: The number of excellent GNOME-shell themes have started increasing and Black Glass is another example of a very good theme for your shell. Get this beautiful greenish theme from here. Adwaita White: This is a beautiful transparent greyish-white theme for GNOME-shell. You can download it from here. Needless to say, the Faenza iconset goes very well with this theme. London Smoke: This beautiful dark styled GNOME-shell theme is a port of the GTK2 theme. Get it here. You might also want to try out the fractal wallpapers here. Nord: Nord is an amazing theme based on Zukitwo. This transparent GNOME-shell theme is best known for its excellent color combination. Get it here. Get an wallpaper set from here. GTK3 themes are better than their predecessor. There are fewer GTK themes than GNOME-shell themes but this may change very soon. The best themes which we have found are: Adwance, Adwaita Drakfire, Atolm and Hope. Instructions on how to install GTK3 and mutter themes are also provided. This list will be constantly updated with new themes. Adwance: This GTK3 theme is inspired by the Ubuntu Ambiance theme. Besides a few minor changes, this is more like the Ambiance GTK2 theme. Use it with a dark shell theme and you should get the ultimate desktop. Adwance is available here. Atolm: This amazing GTK theme looks best when used with the Atolm GNOME-shell theme. The GTK theme has received various updates recently including toolbar, combo boxes, gradients and various bug fixes. Atolm GTK theme is available here. Adwaita DrakFire: This can be thought of as a substitue for the Elementary GTK theme. Adwaita DrakFire looks quite like Elementary but there are some clear differences. Coupled with the Elementary GNOME-shell theme, Adwaita DrakFire looks great. Download the theme from here. Hope: The Hope GTK2 theme has been ported to GTK3 and the result is this amazing black and white theme. This theme looks best when coupled with a dark shell theme and a vividly colored wallpaper. The Awoken icon set looks great with this theme. Download the theme from here. Zukitwo: This is a nice light greyish GTK3 theme which also has a GNOME-shell theme. This is a very clear and uncluttered theme and is soothing for the eyes. You can download it from here. MintLiner: This theme has been inspired by Minty Freshness of LMDE and has a light green, grey feel to it. MintLiner does not have a GTK2 theme and applications which have not been ported to GTK3 may not look correctly. Download it from here. To install GTK themes, you have to install a software called GNOME Tweak Tool. This is a small application which can easily change the default theme (for those who are using the GNOME 3 ppa, GNOME Tweak Tool is avaiable there). Simply open GNOME Tweak Tool and set the GTK theme to the theme which you have just copied. Open gconf-editor with administrator privileges. Go to Desktop > Shell > Windows and change the theme value to the name of the theme you want. GNOME-shell is in active development and therefore we can expect an easier way to install new themes in the future. There is already an extension in development which makes the installation of GNOME-shell themes easier.